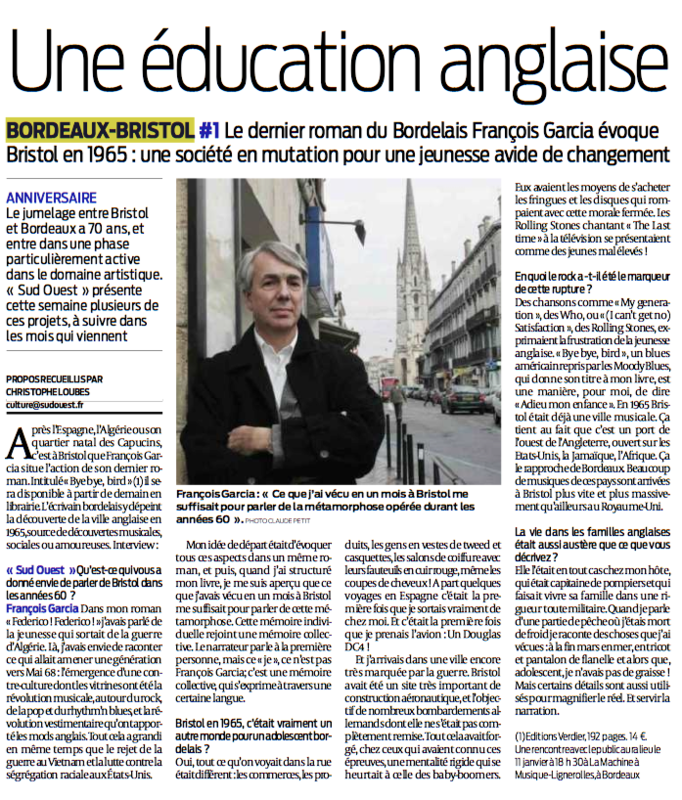 Christophe LOUBES, journalist for the local newspaper SUD OUEST from Bordeaux, has dedicated some press articles on artistic projects between Bristol and Bordeaux. Five interesting articles to read !!! The Bristol Bordeaux Partnership would like to thank Quartet for their generous support towards the Bordeaux/French elements of the 2017 Bedminster Winter Lantern Parade (BWLP). Thank you to the whole BWLP committee and in particular chair Malcolm Brammar and schools artist Alan May. It was Alan’s creative genius and enthusiasm for Bordeaux and its artists which inspired the children to produce hundreds of amazing lanterns including the six giant ones which wowed the crowds lining the streets of Bedminster. Southville Primary created Matisse themed lanterns. Over 60 children contributed to the making of 4 large white dove silhouette lanterns, based on the later works of the French painter Matisse, featuring white doves on a blue background. 60 individual lanterns were also created by all the children using paper cut-out techniques. 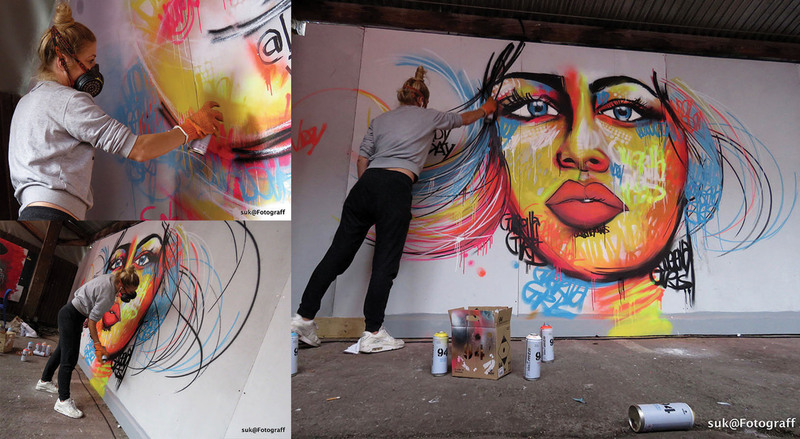 Ashton Gate Primary worked on their Urban Art lantern inspired by Bordeaux artist Lady JDay who took part in the 2017 UPFest. The children used new spray paint techniques to create backgrounds for their individual lanterns (90 in total). 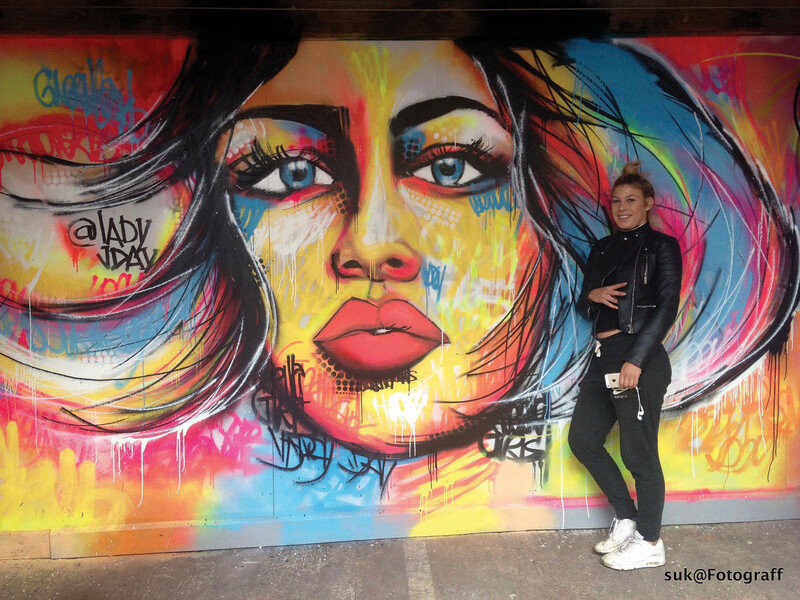 LadyJDay’s artwork which Alan May asked her to produce on acetate paper during UPFest, was used imaginatively to create a 3m high spray can lantern which the children loved carrying in the parade. The 90 pupils researched local street art and were inspired by a number of artworks featuring the human eye – these would be the central theme for the design of the 90 small lanterns. With the assistance of a local stencil artist, Stewy, they were able using spray paint techniques to create the backgrounds for their lanterns. The giant spray can lantern sprayed out the illuminated letters of the school ! Victoria Park Primary chose a Bordeaux Cubism theme and constructed a 3m high Bordeaux gate, L’Hote cubist-style, based on one of the main medieval archway entrances to the city. The children were stimulated by a more modernist approach. They decided to use Cubist techniques to create portraits on 90 small lanterns. They had an idea to create a 3D chateau, also using Cubist techniques and research led them to an image of Bordeaux’ Porte Cailhau in the Quartier Saint Pierre, which was then redesigned. One of the conical roofs was replaced by a wine bottle and windows and gates became eyes and mouths. They also used messages and words celebrating the Bristol/Bordeaux link. An accordionist accompanied them on the parade adding an extra French cultural element. The children made 90 individual Cubist portrait lanterns with messages in French. 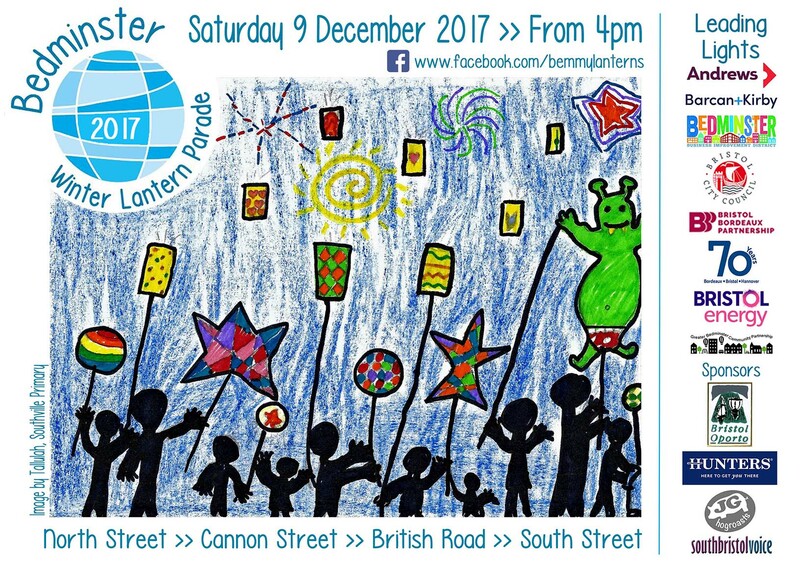 Come to the Bedminster Winter Lantern Parade next Saturday ! This year there will be lanterns specially designed to celebrate the 70th anniversary of the Bristol Bordeaux twinning, and the city’s link with Oporto in Portugal. As part of the pre-Parade entertainment, you will discover Cecile, French-born singer and songwriter living in Bristol. She will sing on the North St/Raleigh Rd junction from 16.00. See you next Saturday !! A warm welcome at the Association Bordeaux-Bristol, with Valérie Bonnet. 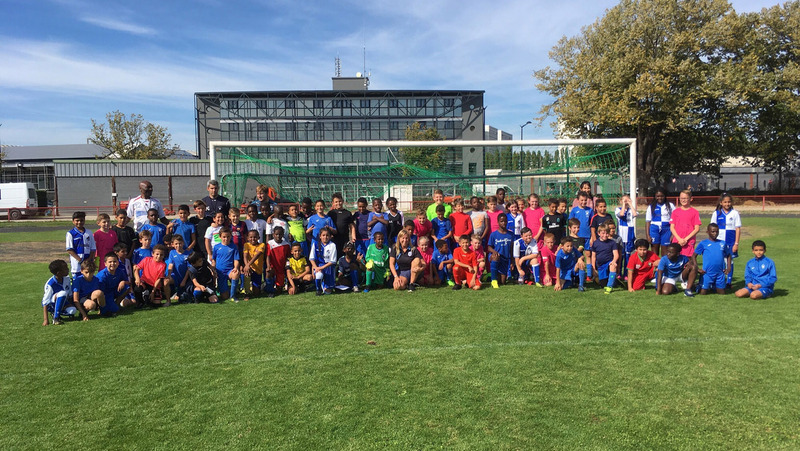 On the morning of Tuesday 26th August, 20 footballers from four different Bristol primary schools arrived at Bordeaux Airport to warm sun and a warm welcome from their twin city. They spent the following three days being shown some of the most interesting and exciting things Bordeaux has to offer. 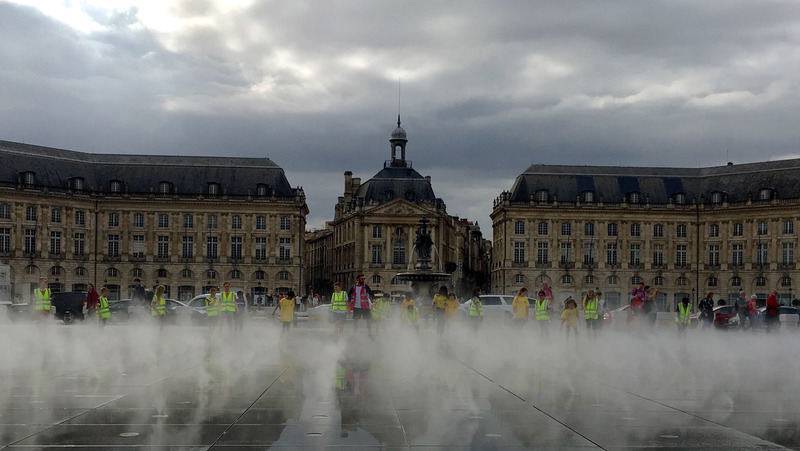 From an open top bus tour to a reception at the City Hall, where the group was privileged to meet Bordeaux’s Mayor, Alain Juppé himself, these young Bristolians had the chance to see all around a completely new city during what was for most of them their first time in France. They met children from Bordeaux’s Dupaty School and Chantecler Football Club and a number of them remarked just how similar their French peers were despite having imagined that they would be unlikely to get along. Football and fun and games sufficed as a common language as Chantecler and Dupaty put the children into mixed teams and a number of new friends were made. Having been greeted at the Association Bordeaux-Bristol, who helped to make this visit possible, where they tried all sorts of new French snacks, the group wandered around the city, buying souvenirs and making memories, finishing their trip with a private tour of the new Matmut-Atlantique Stadium and an afternoon in the sunshine swinging through the trees at Acrobranche, ‘the scariest but coolest place ever’ according to one boy arm in arm with a new friend from a different school in a different part of Bristol. ‘It was really brilliant to see kids from Bristol, some of whom were outside the UK for the first time, splashing around in the Miroir d’eau and climbing through the trees at Acrobranche. They didn’t let the language barrier hold them back from having an amazing time and they were inquisitive and gracious throughout the three days. They threw themselves into every activity and were a credit to their schools as well as the city of Bristol. It was especially great to see girls being given a chance to play the sport they so clearly love and it was so much fun to see kids from different schools making friends with each other and learning about a new country together. 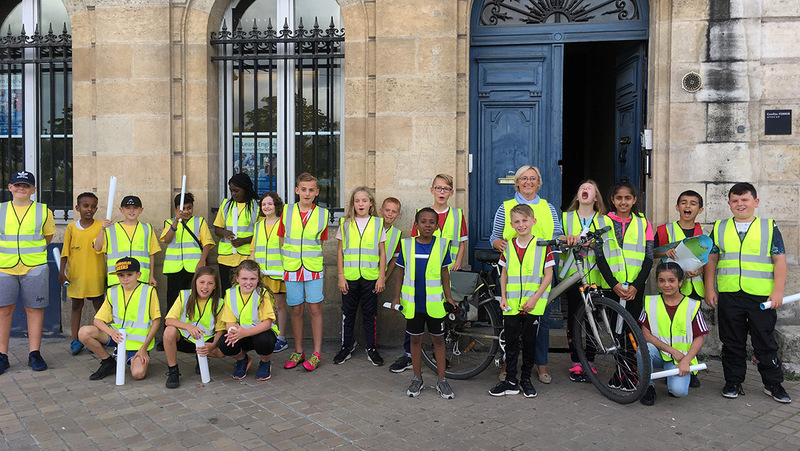 Community of Purpose has done a wonderful thing in setting up this trip – Amy Kington’s hard work has definitely paid off as the group of kids and adults alike discovered life in Bordeaux and how valuable the twinning between Bordeaux and Bristol really is’. Article from Poppy Madaras, Intern at Association Bordeaux-Bristol and group guide. Thanks to the Quartet Foundation for their support. “The challenge of growing the economy, whilst ensuring that all our citizens are included in a prosperous future, is one we face today. This could be a further challenge with Brexit on the horizon. One of the ways we can contribute to the development of our city in a post-Brexit world is to work with other forward-looking cities in Europe with similar high tech and creative industries. Our long-term relationships with our twin cities of Hanover and Bordeaux offer us the opportunity to build on a great platform of friendship and understanding, to develop deeper collaboration and trade growth. We can also learn from each other and improve the quality of life, social economy and cultural experience in our cities. Attend the Three Cities Conference to discuss developing our cities through ‘Inclusive Growth’ on the 19th October at The Bristol Hotel. Please visit our website at www.3citiessummit.com and follow instructions to reserve your place on the Bookings page“. City of Bristol Rowing Club have had a great visit from Club d’Aviron de Bordeaux (Emulation Nautique de Bordeaux) rowers this weekend – part of our celebration of the 70th anniversary of the twinning of our cities. It was such a pleasure to host this group of lovely, polite, friendly sportsmen. They were a credit to their Club! We all hope this inaugural visit will lead to further exchanges between the clubs in both directions. The Bordeaux crew had a good, training row on Saturday in perfect conditions. They went down the docks, through the city of Bristol and along the Feeder, coxed by CoBRC cox, Paddy (aged 82). 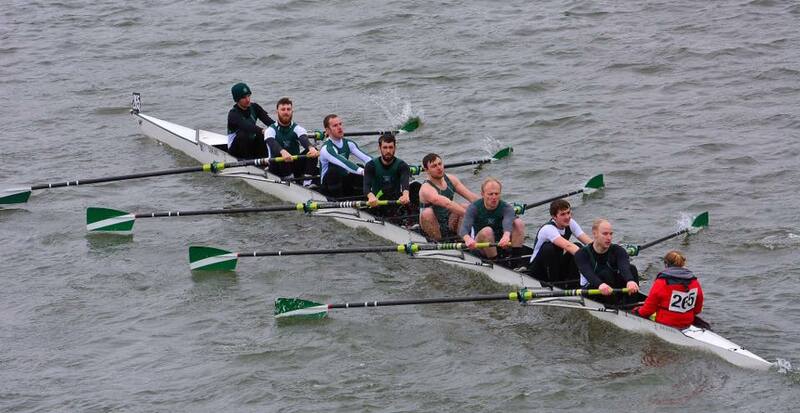 They had three sprint races on Sunday, against a good CoB crew. Bordeaux took a little time to warm up (especially after a good party on Saturday night at Underfall Yard) and lost the first two. However, they came to life in the final race and took the honours in that one. So, 2-1 to City of Bristol RC this year. Of course, the weekend was not about rivalry (well, perhaps a bit!) but about friendship and building relationships. Plenty of that went on, and every effort will be made by both clubs to keep the exchange going in future years. 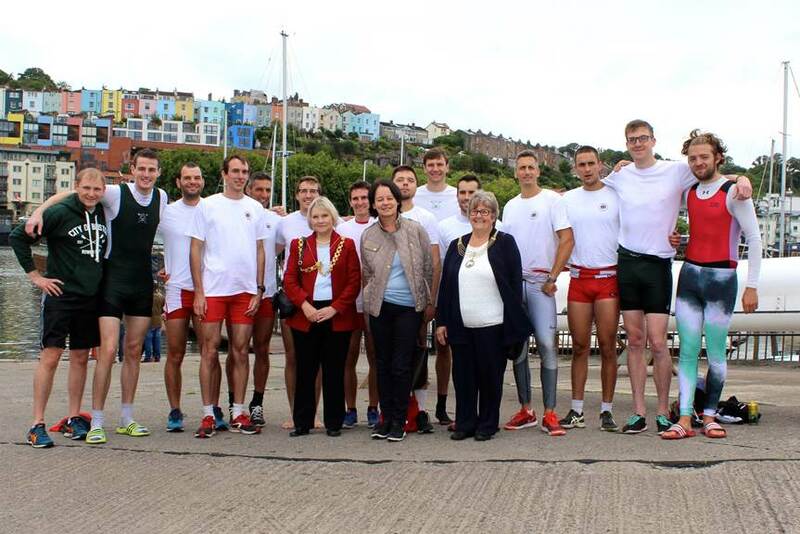 Lovely to have the Lord Mayor of Bristol, Lady Mayoress and Honorary Consul for France (Bristol & Bath) down at the Harbourside to watch the racing and meet the crews. The Lord Mayor also presented the certificates and tee shirts to City of Bristol juniors who have passed their initial ‘start to row’ programme. Thanks to all who have helped out ! 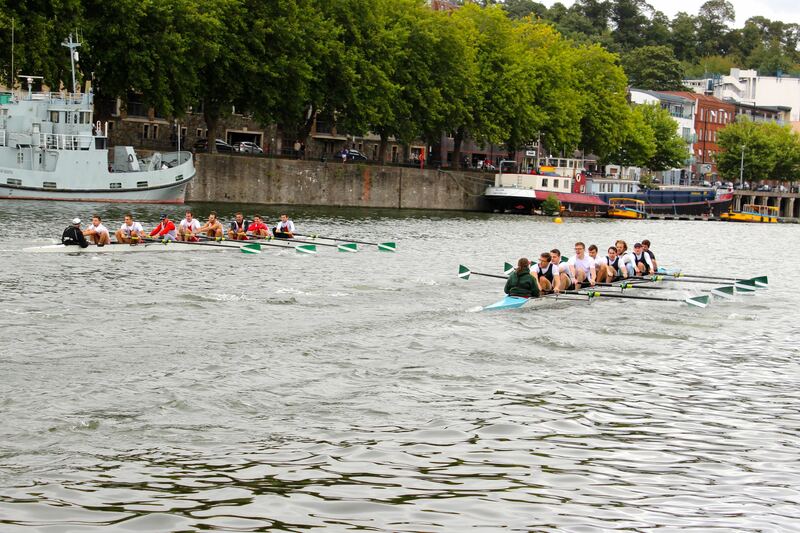 As part of the ongoing 70th anniversary celebrations of the Bristol-Bordeaux twinning, a Rowing Regatta will take place in Bristol docks this weekend, 9th/10th September, with teams from both Bristol and Bordeaux taking part. Come to meet the rowers and watch the races on Sunday ! The Bordeaux crew will be down at City of Bristol Rowing Club from 8.30am and will be rowing between 9am and 10.30am. The rowing club is based down by the SS Great Britain at The Boathouse, Albion Dockside Estate, Hanover Place, Bristol, BS1 6TR. Below : Bastien Ripoll and Alastair Watson at Bordeaux Rowing Club Regatta. 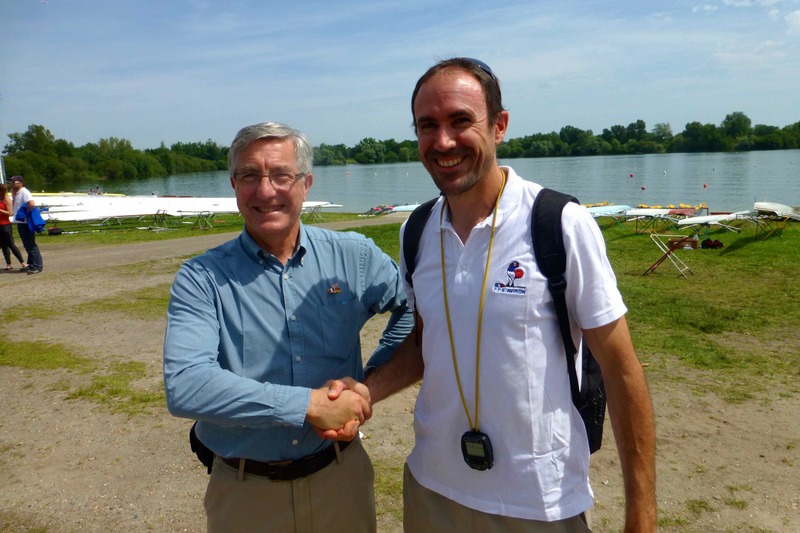 Bastien Ripoll, Oxford Blue and French Olympic rower, is chief organiser of the trip to Bristol.